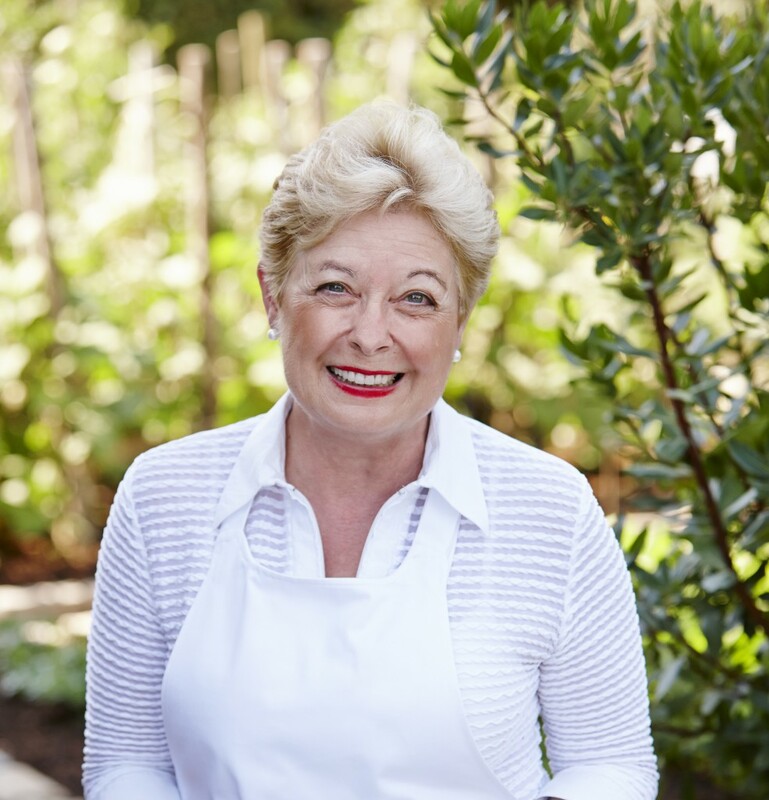 Patricia Wells, for more than two decades the restaurant critic for The International Herald Tribune, is the author of the award-winning Bistro Cooking, as well as more than a dozen other books. She also runs a successful cooking school—At Home with Patricia Wells—in Paris and Provence, where she and her husband have lived for more than 30 years. The Food Lover’s Guide to Paris (Workman; March 2014) is the enchanting and delicious revision of the classic bestseller with all new photos, 450 entries, 345 of which are entirely new. 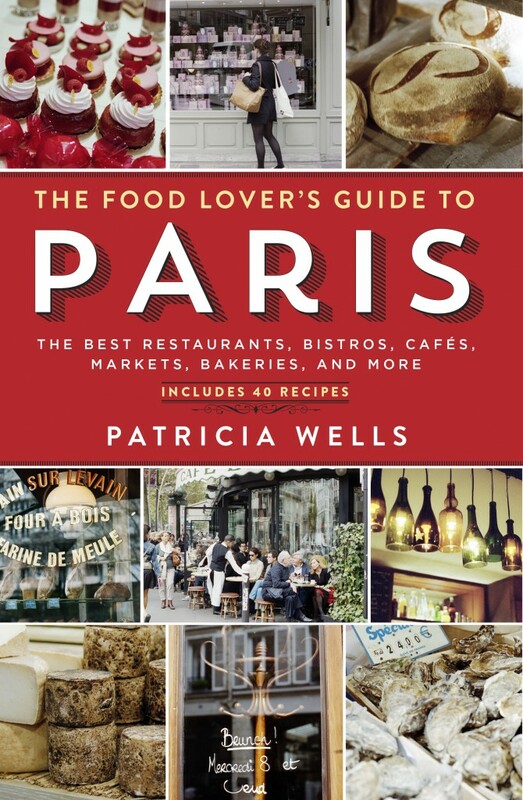 In this beloved culinary guide, Patricia Wells takes readers, travelers and diners to the best restaurants, bistros, cafés, patisseries, charcuteries, and boulangeries that the City of Light has to offer. Whether the urge is a simple one, like satisfying a mid-afternoon sweet tooth on rue Rambuteau (try Pain de Sucre) or grander, deciding between vaunted Pierre Gagnaire or the “little jewel box” Yam’Tcha, Patricia tells us what is new and wonderful, and what is gloriously familiar and still to be treasured. Each entry includes detailed practical information, from the closest metro stop, to the best way to make a reservation, and the not-to-miss specialties of each address—each spot is personally selected and recommended by the foremost restaurant critic and acclaimed authority on French Cuisine. Excerpt from The Food Lover’s Guide to Paris, “Reprinted with permission from The Food Lover’s Guide to Paris, by Patricia Wells, copyright ©2014. Published by Workman Publishing Company.” Including recipe for Willi’s Wine Bar’s Bittersweet Chocolate Terrine. AWP: Why did you feel that now in particular would be the right time to publish your book, The Food Lover’s Guide to Paris? PW: The last edition of The Food Lover’s Guide to Paris was updated in 1999. After we created The New Food Lover’s Guide to Paris application for the iPhone and iPad, bringing back the book seemed like the logical next move. AWP: Where you on a quest to taste the last great French dishes before they disappeared forever—from Paris’ surviving haute cuisine establishments to the tiny local restaurants that still serve regional dishes from Provence to Paris? PW: I don’t think that anything has disappeared from French cuisine….food is fashion and trends as well as dishes come and go. AWP: Tell us about the research for the fifth edition of The Food Lover’s Guide to Paris. What were the challenges, and how did you unfold the story you wanted to share? PW: The most challenging part of creating a guide such as this is to be current and up to date. The Paris food scene is changing so rapidly, and growing so much, I could spend each day, all day, researching and never feel caught up! AWP: During your research for The Food Lover’s Guide to Paris, what restaurants, bakers, chefs or shopkeepers wouldn’t you include? PW: When Alain Ducasse took over Chez Allard last year, I re-visited and just felt that service was awful and food so-so. I also judge by the neighborhood: When there are so many great places in that area of the 6th arrondissment, why include a restaurant that is not stellar? AWP: What was the most surprising thing you learned about French food and the intertwined culture and tradition of chefs in up-and-coming neighborhoods in Paris? PW: I love the youthful spirit of the chefs and shops in up-and-coming neighborhoods. I love the attachment to the fresh, local, and seasonal. It’s always been there, but not with such fanfare. AWP: What was the most surprising thing you learned about French chef’s culinary secrets? PW: I think the ability to be constantly challenged to create new dishes, and to share that enthusiasm with diners. AWP: When you started writing The Food Lover’s Guide to Paris (5 edition), did you have a sense of what you wanted to do differently from other editions? PW: I wanted to maintain the spirit of the original 1984 edition but to also be modern, highlighting vegetarian options and paying close attention to good value. PW: Its history, beauty, and reverence for quality, fresh ingredients. PW: Bistro Paul Bert: It is both classic and modern at the same time. PW: Semilla: It is always lively, the food is fresh and modern, the wine fabulous. I could eat there once a week! PW: Yes, certainly, cafes and restaurants such as Brasserie Lipp, Deux Magots and Café de Flore are examples. PW: Diners are certainly more informed and perhaps more critical than ever. I wish that people would not dress like bums and pay a bit more respect to those around them. AWP: Is the younger generation in Paris seeking a different kind of taste or lifestyle experience? PW: Absolutely. More casual, for sure. AWP: What are some of the younger chefs in Paris cooking and serving? PW: Lots of local and seasonal ingredients, an awareness to the organic and sustainable. AWP: What non-French cuisines are making an inroad into local Parisian dishes? PW: The Japanese influence is everywhere, as well as anything Asian. PW: Do some research, and know what kind of restaurant you will be going to. If you can, check out the restaurants web site and look at the menu, you will be a better-informed diner. AWP: Do Parisians have a different attitude toward what they eat than do North Americans? PW: I think somewhat. Parisians tend to be quite classic in their taste: steak and fries remain high on everyone’s list. PW: Certainly bistro food: meaty daubes in winter. Oysters when in season. Wines such as Sancerre and Beaujolais. PW: As the above: oysters remain popular, as does game in the winter months. Also classic desserts such as Paris-Brest, chocolate mousse, and now, macarons. AWP: What was the first dish that made you fall in love with French cuisine? PW: Wow! That’s hard to say. I do remember making a lot of classic French dishes—such as cassoulet—not ever having tasted them in France. For sure, a lot of chicken dishes, such as a simple fricassee, or a simple French potato salad. AWP: What has influenced your own style of cooking? PW: Fresh ingredients. I love to make a dish that has only three ingredients and make it sing! AWP: How do you stock your Paris kitchen, your Provence kitchen? Do you have staples? PW: In both places I always have fresh herbs growing outside, my pantry always includes ingredients to make a quick pasta dish (dried pasta, tomatoes, capers, jars of artichokes) of course my own olives, olive oil, honey. I make sure there is a selection of cheeses in the refrigerator and usually have some good things in the freezer, such as portions of a beef daube and sausages. AWP: How do you orchestrate a meal from appetizers to dessert when entertaining in your home? What are dinner parties like for you? PW: I make certain that almost everything is prepared in advance, leaving only a very few tasks for the last minute. I like to be a guest at my own dinner parties. I am extremely organized, and may even set the table a day in advance, open the wine in the morning, etc. AWP: Entertaining at home in Paris: are there unspoken rules? PW: We don’t entertain very much in Paris, for we don’t have the room. I guess if there is an unspoken rule it is that it’s simple, seasonal, and delicious. I never try out a new dish when I entertain, I always go for recipes that I know work. PW: I rarely dine alone. Except for sushi. I often go to lunch by myself and enjoy sushi. But dining is such a social experience I dine with friends and family. AWP: August Escoffier said: “Cooking becomes genius when things taste of what they are.” Which chef best understands the chimera or simplicity of this aesthetic? PW: Guy Savoy: I recently ate there three times in a month and never had the same dish. His creative spirit and mind constantly amaze me. I have tremendous admiration for him. PW: Simple. Fresh. Seasonal. Healthy. PW: People who visit France always complain that there are not enough salads. Green salads. I think that the French eat so much salad at home they don’t think of it when dining out. AWP: Do you think North American cooks are afraid to trust their instincts? PW: I think, yes. It takes years and years of experience in the market and in the kitchen to trust one’s instincts. PW: I was once researching French etiquette of table seating. I found that one never put a married couple next to one another unless they had been married less than a year. At one festive dinner in Provence, I had invited both a Michelin 3-star chef and the local mayor and could not decide who should sit to my right. I ended up putting the chef to my right and the mayor to my left. PW: Yes. Although I rarely complain if it is really serious—such as in one case, leg of lamb arrived almost raw—I do. But that said, I believe that in France the diner is not necessarily listened to. In the case of raw lamb, the waiter just shrugged and almost wagging his finger to me, said “Madame, that’s the way we eat it in Provence.” Not true. AWP: You own a cherished item from Julia Child’s kitchen when she lived in Grasse in the 1960s. What’s the story? PW: In the late 1980’s and early 1990’s Julia generally stopped at our house on her way to Grasse. I knew that she was going down to close up the house. I always joke that having Julia’s stove is like having Freud’s couch. I asked her if I could buy the stove. She said no. Then she came down the next morning and said that she had changed her mind. She would give it to me if I replaced it with a new one. And we did! We still use her sturdy La Cornue stove today! AWP: For four years you combined talents with the internationally acclaimed French chef Joël Robuchon. In your book, L’Atelier of Joël Robuchon: The Artistry of a Master Chef and His Protégés, you were welcomed into his privileged and secret universe, and his way of expressing and marrying flavors. What was this experience like? PW: It was like going to church every day. Then he was at Jamin, about a 30-minute walk from my apartment. I would spend the morning in the kitchen, just making notes and taking pictures and questioning the chefs. I still think of those days as some of the best in my life. It was truly like getting a PhD in food! AWP: Your career has taken you from restaurant critic into the world of writing and teaching about cooking and food. What inspired you toward a life and career so dependent on words and the ability to communicate? PW: I knew from a very young age that I wanted to be a journalist: interviewing people and telling their story. I actually studied to be an art critic and had a weekly art column for The Washington Post in the 1970s. But my passion for food and cooking took over and I never looked back. I began writing about food full time when I moved to The New York Times in 1976. AWP: Your books have had a huge impact on cooks and food lovers. What do you think it is about your books that make readers connect in such a powerful way? PW: I hope that the recipes convey an enthusiasm for food and cooking, that the recipes work! PW: There is nothing greater than being able to trust and respect a certain food writer: the traveler benefits from all the research and hard work that person has put into it. PW: My husband, Walter, and I were working at The New York Times. He was an editor and I was food writer. He was offered a job to come to Paris as an editor for the International Herald Tribune. We thought, perfect, we’ll go for 2 years. That was 34 years ago! Walter likes to say that we came for his job and stayed for mine. PW: I cried a lot the first six months. Walter worked long hours, and I worked out of the spare bedroom, free-lancing for The New York Times, Travel & Leisure, Food & Wine, etc. I spent an awful lot of time alone. But no matter how “bad” it was I knew that we had made the right decision. PW: I think trying not to be a noisy American. To be discreet and not ask questions that are too personal. To dress up! PW: I think all of the above. Discretion is key. AWP: You moved to Paris in 1980. What was Paris like nearly thirty-five years ago? How is it different today? PW: The city is far more casual, more international, shops are open 7 days a week, and there is much greater choice everywhere. AWP: What is the best part about living in Paris, in Provence? PW: The beauty. The markets. The blue skies of Provence. My garden. PW: My everyday Parisian life is rich with variety. I rise very early, often before 6 am. I work in my kitchen and have a fire going almost all the time. It’s my friend in the kitchen. Early mornings I catch up on little projects: writing, emails, accounts. I listen to music as I work. Drink lots of coffee. Most shops and markets are open by 8:30 so by then I try to be up and dressed and out the door. I’ll do whatever shopping needs to be done, run errands, probably go to lunch with my assistant or with Walter, research a few shops, then probably go back to work, or back to the kitchen to test recipes. I sometimes wander through the open-air markets, even when I have very little to buy. The markets inspire me. PW: This may be silly, but most visitors don’t know how fabulous the bus system can be! I have a friend who rides a bus line from its starting point to its finish, just to get an aboveground feeling for the geography of Paris. PW: I want to continue with my cooking school, making it as rich an experience as possible for all students. I am working on more specific education on cooking techniques as well as more education on wines. I love books by my friends, such as Ina Garten, Dorie Greenspan, and Martha Rose Shulman. I devour books on bread and think that David Lebovitz’s new book, My Paris Kitchen, is extraordinary. I also love Donna Hay’s style. The Food Lover’s Guide to Paris by Patricia Wells, copyright ©2014. Published by Workman Publishing Company. When chef Pascal Barbot and partner Christophe Rohat first opened the Parisian Right Bank restaurant Astrance in 2005, this intriguing soup was on the menu. To this day, they often serve the magical liquid as a first course, offering no hint of its ingredients. They don’t present it as a test, really, or even a game, but it’s fun to sit at the table and try to figure out what the contents might be. Over time, we’ve guessed mushrooms, truffles, maybe divined a bit of smoky bacon, but never thought of burnt bread. 1. In a skillet with no added fat, brown the bacon over medium heat until crisp and golden, about 5 minutes. Drain on paper towels. 2. In a saucepan, bring the stock to a simmer. Add the bacon to the stock. Cover and simmer for 20 minutes, allowing the bacon to infuse its flavors and aromas into the stock. Strain the stock through the fine-mesh sieve set over a bowl. Discard the bacon. Return the stock to the saucepan. 4. At serving time, pour the soup into a saucepan and bring to a simmer. Taste for seasoning. If the soup is too thick, add additional stock to thin it out. With an immersion blender whisk the soup to create a thick foam. Pour into demitasse cups and serve warm as an appetizer. VARIATIONS: Add a few spoonfuls of truffle juice or, better yet, the juice as well as a few thin slices of fresh black truffles. THE SECRET: Infuse, infuse, infuse. While it may seem strange and even wasteful to cook bacon, infuse vegetable stock with its smoky flavor, and then discard the bacon, the end result is a lovely, mysterious soup base. Text copyright ©2014 Patricia Wells. All rights reserved. Photography copyright ©Workman Publishing/The Food Lover’s Guide to Paris. All rights reserved. Portrait photography copyright ©Jeff Kauck. All rights reserved. Leave a reply on "French Impressions: Capital Fare: Patricia Wells on great French food in Paris"